These backyard bird ornaments live outside or inside made with 100% natural wool and non-toxic, azo-free dyes they are weatherproof. Measuring 5 inches in length this bird has a string loop and attractive info card. Walking into the Kathmandu production center reception you are immediately greeted by a cheerful Salute the God Within You with hands pressed together in a prayerful expression. Proceeding into any of the production halls you be greeted by a complete chorus of the same as dozens of ladies press felt into a variety of shapes, while others stitch, needle and applique to finish hundreds of different styles of decorative items for export. Sheep's wool is an amazingly adaptable fiber. It can be dyed any color and when hand felted using warm mildly soapy water it can be molded into any shape, or then cut and sewn together as per your imagination. Because the felting and most of the stitching process is all done by hand with natural materials that can be sustainably harvested, hand felted products have a relatively soft impact on the environment. 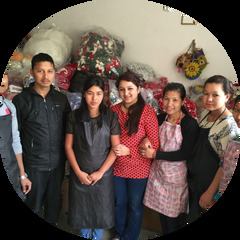 Commercial exports of felted products from Nepal have grown exponentially since around 2000, benefitting thousands of mostly women workers, production managers and family businesses who help support their families and educate their children with their earnings.